The Arrow460 Granturismo series of dayboats, developed by Mercedes-Benz Style and Silver Arrows Marine, will go into production at Finnish yard Baltic Yachts, it has been announced. The 14 metre cruiser made its public debut last month at the Monaco Yacht Show, where it turned heads with its sleek automotive styling. Construction of the first commissioned yacht is expect to begin in Jakobstad before the end of the year. Ron Gibbs, chairman of Silver Arrows Marine, said: "We have not only developed a new yacht with Mercedes-Benz Style, but also a new industrial concept to build it, inspired by the automotive model where excellence is expected in all aspects and at all levels." The Arrow460 Granturismo blends the look and feel of an open sport boat with the livability of a compact cabin cruiser. The hull lines were created by naval architects Martin Francis and Van Oossanen. 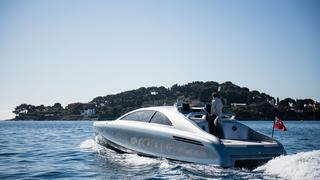 The prototype was built in Switzerland at high-tech composite specialist Group Carboman, taking its styling cues from Mercedes automobile proportions of a long hood and a short aft deck. Silver Arrow was the name given to Mercedes-Benz racing cars in the 1930s and allowing Silver Arrows Marine, a British-registered company with its main office in Monaco, to use this moniker speaks volumes about the car company's involvement with the vessel. "The Silver Arrow of the Seas stands for modern luxury, avant-garde style and comfortable elegance. 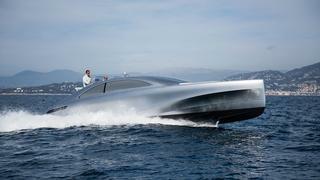 The yacht embodies the Mercedes-Benz progressive, dynamic design philosophy of sensual purity on the water. Or, to put it another way, it is hot and cool at the same time." said Gordon Wagener, vice president of Design Daimler AG. 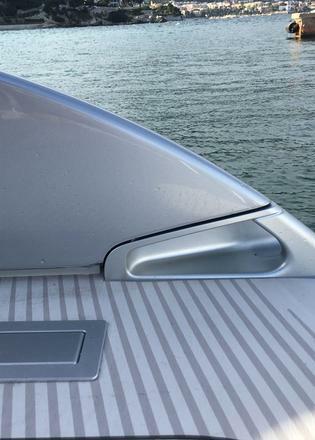 While the concept for a sleek multi-purpose boat perfect for zipping along the coast or anchoring out is not exactly new, the determination to maximise the use of space with almost "transformer-like" convertible features and furniture is truly innovative. For example, the curved roof line and side windows open by dropping down into the body. The level of custom detail found throughout is also remarkable. Almost nothing is off-the-shelf due to the insistence of the Mercedes-Benz Style teams in Lake Como, where the interiors were created, to the exterior styling team headquarters in Sindelfingen, near Stuttgart, Germany. The yacht is designed to accommodate 10 passengers, comfortably seated on two large couches or two smaller lounges. A glass and matt chrome table slides out of its hiding place underneath the sunpads on the bow to either coffee table or dining table size. Slide the table away and a bed emerges for an overnight berth. Curved, soft gray eucalyptus wall panels hide a heads compartment and a separate dressing area. The same wood material has been molded into veneers expressing almost impossibly complex curves that invite touch. On deck Estec flooring material does not imitate teak, instead it is in a two-tome pattern that emulates the natural curves of sand on a dune. 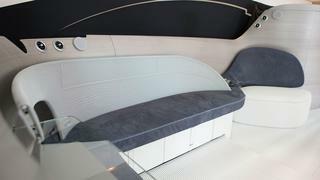 It is the first time the company has created such a product for use on yachts. 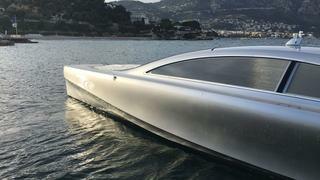 "Every thing about this boat is real," said designer Stefano Tam. "Why would we use something that looks like fake teak? This is absolutely the best lightweight decking material, Let's celebrate what it is." The Arrow460 is no slouch either — she is powered by a pair of Yanmar six-cylinder diesels generating 480hp each. Cruising speed is 28-30 knots with a 40-knot top end. 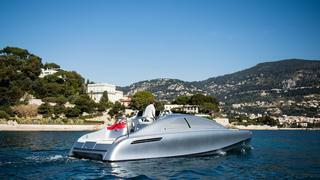 The Arrow460 Granturismo is just one recent example of car manufacturers designing boats. 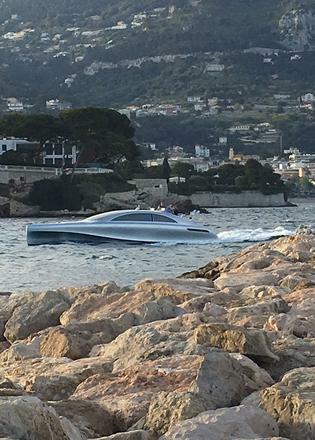 The Aston Martin AM37 sportsboat also made its public debut at Monaco Yacht Show 2016.